[ Winchester Cathedral, the Philpot Window. ] Detailed coloured drawing by Alice Philpot of the stained glass window she donated to the Cathedral in memory of her husband, son and family. 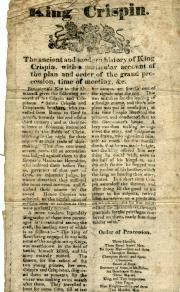 With newspaper cutting of long article describing the window. [ Winchester Cathedral. ] Dated by Philpot 29 July 1917. John Vaughan, in his 'Winchester Cathedral, its Monuments and Memorials' (1919), describes the Philpot Window on p.303, stating that it was executed by Messrs. Powell of Whitefriars, and was 'the gift of Mrs. Alice Philpot, whose husband and son are also commemorated'. On the strength of the present illustration, Alice Philpot is quite capable of having designed the window in addition to donating it. It is on one side of a piece of laid grey tracing paper, roughly 57 x 36 cm. 17 Bute Gardens, Brook Green, Hammersmith, W6, 2 July 1942. One page, 4to, good condition. "It is not possible to give an opinion as to the value of the drawings referred to by Messrs Mills & Bantock in their letter without seeing them. | I would suggest that you should ask for a sample to be sent to the Society and then either Mr Dugdale, Mr Geoffrey Holmes, Mr Milne or myself could look at it on the 13th either before or after the Council meeting. | However it would be advisable not to commit the Society to giving an opinion but only that it would give the matter consideration." [ George Kruger Gray, artist. ] Autograph Letter Signed to G. K. Menzies, Secretary, Royal Society of Arts, declining to give a lecture on heraldry. 40 Abingdon Road, Kensington, W8. 2 December 1921. 2pp., 12mo. Bifolium. In good condition, lightly aged, with strip of sunning at foot. Docketed with stamp of the Royal Society of Arts. 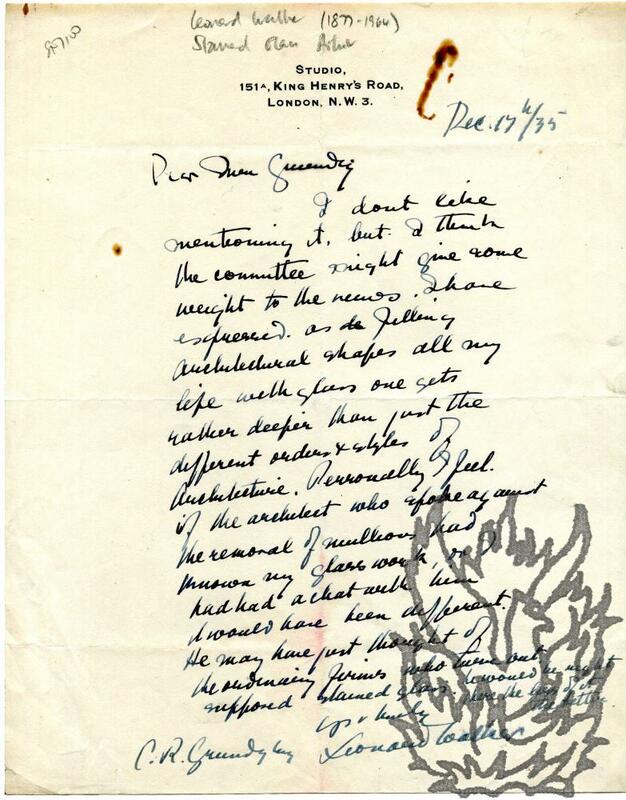 Having 'had time to consider the question of a lecture on Heraldry' he has decided to decline Menzies's invitation, as he 'simply cannot spare the time such a lecture would require for its preparation'. [Stained Glass] Autograph Letter Signed 'C.E. Kempe' to 'Mrs. de Robeck' about her seeing his 'man's' work. [Printed heading] 28 Nottingham Place, W. [London], 16 Jan. 1907 [died in April]. Three pages, 12mo (large hand). "I am sure my man - Mr Tombleson - will be glad to show you - & your friends - his work completed - & his work in course of completion. | But the sky is not [underlined] favourable - You must try & find a sunny day [...] ". He discusses his new home, and thanks her for her Christmas card." Autograph Manuscript Signed, an untitled holograph poem by the Scottish writer and artist James Ballantine, beginning 'Confide ye aye in Providence, for Providence is Kind'. 1p., landscape 8vo. On the first leaf of a bifolium. Very good, on lightly-aged paper. Well presented, with the second blank leaf neatly inserted into a windowpane border. The poem is sixteen lines long, arranged in four stanzas, neatly written out on a piece of wove paper. The first stanza reads 'Confide ye aye in Providence, for Providence is Kind | And bear ye a' lifes changes, wi a calm an' tranquil mind | Though pressed an' hemmed on every side, hae faith, an' ye'll win through | For ilka blade o grass keeps its ain drap o dew'. 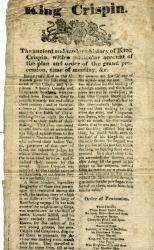 Printed handbill 'ADVERTISEMENT' concerning the recall of the 'Sixtieth Thousand' of 'Through the Looking Glass'. On one side of a piece of wove paper roughly 18 x 12 cm. Headed 'ADVERTISEMENT.' and signed in type 'LEWIS CARROLL. | Christmas, 1893.' Twenty-eight lines of text. 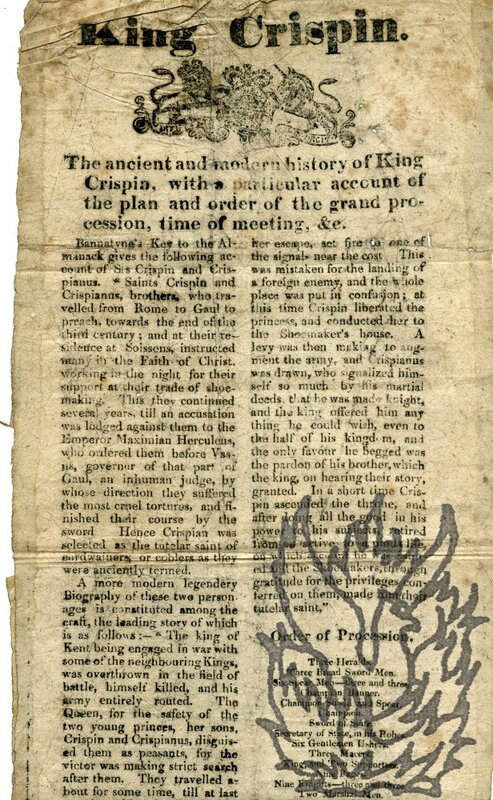 In good condition on lightly-aged and spotted paper. Begins 'For over 25 years, I have made it my chief object, with regard to my books, that they should be of the best workmanship attainable for the price. Autograph Letter Signed "C Cahier" to an auctioneer "Chaumette des fosses, chez M. Labitte . . ."). In French (En Francais). Charles Cahier, "French iconographer of medieval sculpture and decorative arts" (1807-82). No place, 22 October [no year given]. He describes how he came to find a book which he desperately needs for his studies or "travaux du moment" ("vitraux"; stained glass) in an auction catalogue. He gives details of the book ("D, del Corro, Dissertation theol. ", etc). He would like to buy it for 5 francs before the auction (taking place on 17 November). He makes another request on behalf of M. Vermeil. Autograph Note Signed AND Typed Letter Signed to the Secretary of the Royal Society of Arts (Menzies). Victoria & Albert Museum, 5 and 20 May 1925. 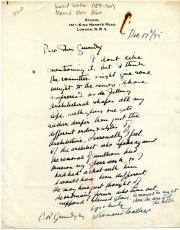 Five Autograph Letters Signed to [G. K. Menzies,] the Secretary, Royal Society of Arts. English glass painter and novelist (1875-1923). All five items in very good condition, and all but the third and fifth stamped and docketed. ITEM ONE: two pages, 4to. He will be 'delighed and honoured by reading a paper before the R.S.A.' Gives a choice of dates and states 'I shall want a lantern.' He wants 'to draw the Society's attention to the fact that the various processes in making a modern window follow the developments of stained glass from the 11th (or perhaps the 9th) century to the beginning of the 15th.' Explains his thesis in some detail, and discusses possible titles.